Whole Life Health offers specialized integrative medical care with board certified medical doctors. While our background is in family medicine and primary care we work as integrative specialists, which allows us to more fully address the roots of your health and disease states. See “Our Team” link for more information. In addition to this specialized practice approach, we offer a variety of IV nutritional therapies. You must be a current patient of one of our practitioners to receive these treatments in order to ensure the IV therapy you are receiving is appropriate for you and your health needs. Current patients are free to come as desired for IV therapy needs, provided there have been no changes in health status or medications. See our menu of IV services and be sure to ask your provider when you come in as we are always updating and expanding our services. 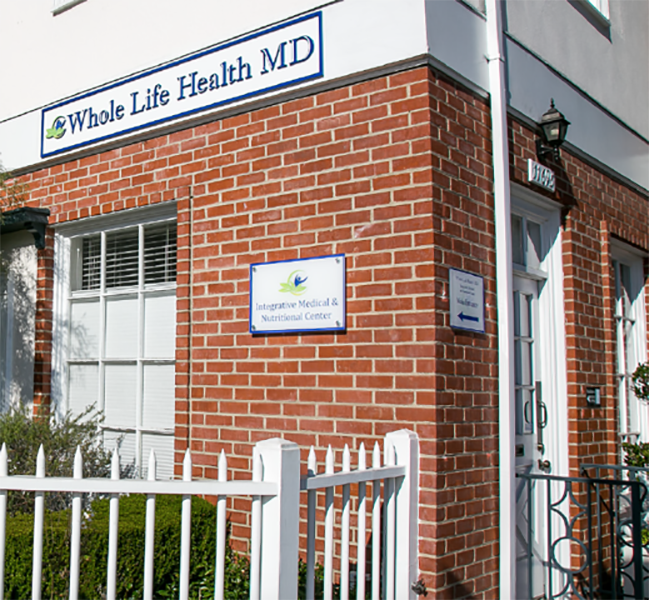 At Whole Life Health MD, we are dedicated to helping you achieve optimal health. We help you address chronic health concerns by uncovering the root causes and nourishing the foundation of your health, rather than merely treating symptoms. It is important that our patients understand and feel comfortable with the type of care we provide. To help you understand what we do and how we do it, we encourage you to fully explore the educational information we have created for you. Click HERE to learn about our practice as well as to find many of the answers to frequently asked questions, such as cost, insurance, services provided, and what to expect as a patient. Option 1: Call 310-914-3400 and press 3. ChARM is our Electronic Medical Record System and your main point of access to all of your medical records, appointments, messaging, etc. After scheduling your appointment, you will receive an email with an invitation to setup your Patient Portal in ChARM. Once you do so, you can access the patient forms listed below. Click HERE to access your ChARM Patient Portal. Did you setup your Patient Portal in ChARM and complete/upload the following? For most new patients, we will order blood work which often requires you to be fasting. If you have a morning appointment and would like to do your blood draw at the time of your appointment, please refrain from consuming any food or drink other than water for 8 hours prior to your appointment. If you have an afternoon appointment and/or you are unable to fast prior to your initial consultation, we can simply schedule the blood draw for another day. Thank you for trusting us with your care, we look forward to the opportunity to support you in health. It is very important to us that you are familiar and comfortable with the type of care we provide at Whole Life Health MD. If you are new to Functional and Integrative Medicine and haven’t yet read the “About” section of our website, please be sure to click HERE to learn more about what we do and click HERE to learn how this innovative type of medicine differs from conventional medicine practices. To ensure you receive the entirety of your scheduled time with the doctor, please arrive 10-15 minutes early for your appointment to allow for the necessary check-in and administrative time with reception upon arrival. Sign in with our reception and complete any additional paperwork or administrative items (please be sure to bring your Driver’s License and health insurance card so that we can make a copy for our records). At your initial consultation, we will discuss your current symptoms, health concerns, medical history, family history, emotional state and relevant personal experiences, stress level, nutrition and diet, exercise, sleep habits, as well as any other information that will help us to understand the contributing factors to your health concerns. If you have any previous lab testing or medical records from your primary or specialty physicians, please bring these with you or upload them into your patient portal prior to the visit so that we can discuss these as well. At the end of the visit, we will recommend relevant lab tests along with a preliminary treatment plan based on your individual health needs and lifestyle factors. This may include dietary or lifestyle recommendations, supplements, IV or injection therapies, lifestyle modifications, etc. For any recommended bloodwork, most patients elect to do the blood draw immediately following their initial consultation appointment, though you are welcome to schedule this for another day if that is more convenient. * If there are any in-office procedures and IV therapies we recommend for you, you may also be able to do this at the time of your initial consultation. *Note: If you would like to do your blood draw the same day as your initial consultation, we recommend that you arrive to your appointment fasting (no food or drink other than water for 8 hours prior) and also abstain from taking thyroid medication that morning, if you are on one. At your second appointment, which is typically 2-4 weeks after the first, we will review the results of any laboratory testing done, as well as discuss how things have changed or improved since the initial consultation appointment. Based on these improvements and the lab results, we will further personalize your treatment plan. After the second appointment, the duration and frequency of your follow-up appointments will be dependent on your needs and the complexity of your conditions. Usually, future follow-up or lab review visits will range from 15-60 minutes. Our goal at Whole Life Health is to provide the utmost quality of personalized care. The following policies have been established in order to maintain this standard of care and to create the best possible experience for our patients. It is important that you read this information carefully. Electronic copies of your medical records (lab results, visit summaries, etc.) are available in your Patient Portal in ChARM. New records will become accessible in your Patient Portal after we have reviewed them with you during a scheduled appointment. For phone appointments, lab results will be accessible the morning of the scheduled appointment so that you can look at them while we review. Medical records can only be released to other providers with your authorization. After receiving a completed medical records release form, we will gladly send your requested records at no charge. It may take up to 72 hours to process these requests. For in-office appointments, you will receive a paper copy of your lab records as well as a printed summary of your visit. Requests for additional copies of medical records are subject to an administrative fee of $0.50 per page and may take up to 72 hours to process. Your pharmacy can fax prescription refill requests to us at (888) 971-4161. It may take up to 72 hours to process prescription refill requests, please plan ahead to avoid any interruption in your medications. Any refills that need to be rushed (processed in less than 72-hours) will be subject to an expedited refill fee of $50. Contact your local pharmacy and ask them to fax us a prescription refill request to (888) 971-4161. Refill requests must come directly from the filling pharmacy, please do not call your physician or medical staff for such requests except in the event of an emergency. To avoid running out of your prescription, please be sure to monitor how many doses remain and contact your pharmacy at least one week in advance. Once we receive the refill request from the pharmacy, please allow 2 -3 business days for your refill to be completed. Fax prescription refill requests to: (888) 971-4161. Please include patient’s name, phone number, date of birth, attending physician, pharmacy number, medication dosage, count, special instructions, and date of last refill (if applicable). All charges for consultations and/or treatments rendered will be itemized and reviewed with you by our reception staff after your scheduled appointment. Payment is due on the day of service. We accept all major credit cards and personal checks. When you schedule your initial visit, we request a credit card on file to hold the appointment for you. This card will remain on file, though no charges will be applied without your approval unless you miss or cancel an appointment without proper notice (See our cancellation policy for more information). Phone consultations and supplement/test kit shipments will be billed to your credit card on file unless you provide other payment information and instructions prior to your appointment. Whole Life Health MD does not accept insurance or Medicare and we cannot guarantee that services rendered (office visits, phone consultations or lab tests) will be reimbursed. You will be provided with a superbill containing diagnosis and procedure codes to assist you with possible insurance reimbursement. You can access your superbills through your ChARM patient portal. For your convenience, we will submit your insurance information to the lab(s) along with the requisition form so that they may bill your insurance directly for testing services provided. You are responsible for any laboratory fees not covered by your insurance carrier. If you have any concerns about the cost of labs, we will happily provide you with a cost estimate prior to ordering the tests. At Whole Life Health we do not double book patients. As such, we require at least 48 business hours advance notice to cancel or reschedule an appointment. Patients who do not cancel or reschedule appointments 48 business hours in advance will be charged the full price of the missed visit. We require at least 24 hours advance notice to cancel or reschedule IV room appointments (including IV therapies, blood draws, ozone therapy, PEMF, etc). Patients who do not cancel or reschedule appointments at least 24 hours in advance will be charged a $35 missed appointment fee. At your initial consultation, we will discuss your current symptoms, health concerns, medical history, family history, emotional state and relevant personal experiences, stress level, diet, exercise, sleep habits, as well as any other information that will help us to understand your current state of health. At the end of the visit, we will recommend relevant lab testing along with a preliminary treatment plan based on your individual health needs and lifestyle factors. Due to variations in treatment style and approach, the structure and cost of the initial consultation is unique to each practitioner. This includes a 2-hour initial consultation with Dr. Salomon, during which she typically does extensive muscle testing (ART) in tandem with the consultation. This includes a 90-minute initial consultation with Dr. Koorjee. We only recommend lab tests that are medically necessary and pertinent to your condition. As a courtesy, we will submit your insurance information to the laboratories so that they may bill your insurance company directly. Coverage for laboratory testing will depend on your individual insurance policy. For those without insurance, many laboratories offer reduced prices. Typically, patients will pay between $200-800 for their laboratory tests. The duration/frequency of follow-up appointments will depend on your needs and the complexity of your condition(s). Whole Life Health MD does not accept insurance or Medicare and we do not file insurance paperwork on your behalf. However, we will provide a detailed receipt with diagnoses codes for all billable services performed in our office for you to submit to your insurance carrier. Some insurance carriers may cover medical services and laboratory tests performed by the physicians. You may wish to contact your insurance company directly if you have concerns regarding insurance coverage for medical services rendered by an “out-of-network” provider. Payment in full by check, cash or credit card is due at the time services are provided. *Note, the office is closed to patients on Thursday, though we are accessible for questions by email and phone. All treatment plans are customized to each individual patient based on the doctor’s recommendations. We offer many different customized IV therapies, the highest-quality medical grade supplements, neural therapy and other in-office medical treatments, and extensive nutrition and lifestyle recommendations for the comprehensive care plans of our patients. Are the doctors Primary Care Providers? Due to the time-intensive nature of care and high demand for services, our patient appointment schedule is booked months in advance. For this reason, our practitioners are not available primary care and patients should always have an in-network primary care physician whom they can see for immediate acute care needs such as seasonal illness, injury, etc. Our practitioners use an innovative systems approach to assessing and treating your health concerns. Utilizing the most advanced diagnostic testing, we look beyond conventional diagnostic approaches to uncover food allergies, hidden infections, environmental toxins, mold exposures, nutritional deficiencies, metabolic imbalances and/or underlying genetic predispositions that might be causing imbalance in the system. Using such advanced testing, along with individualized treatment plans, we see our patients prevent and recover from many chronic and difficult to treat conditions. Our practitioners are highly skilled in treating chronic problems such as fibromyalgia, fatigue syndromes, autoimmune diseases, inflammatory disorders, allergies, hormonal imbalances, digestive disorders, mood and behavior disorders, heart disease, memory problems, and other chronic, complex conditions. What sort of tests do you do? How much do they cost? We only recommend lab tests that are medically necessary and pertinent to your condition. Testing is frequently done to assess nutritional status including amino acids, fatty acids, oxidative stress, vitamin levels, mitochondrial function, food allergies, and heavy metals. Many other tests are available, including genetic testing for a variety of conditions, hormone evaluations, bone health, gastrointestinal health, adrenal function, etc. As a courtesy, we will submit your insurance information to the laboratories so that they may bill your insurance company directly. Coverage for laboratory testing will depend on your individual insurance policy. For those without insurance, many laboratories offer reduced prices for patients who pay for lab fees in advance. Typically, patients will pay between $200-$800 for laboratory tests. Can the tests I need be done at Whole Life Health MD? We perform blood draws in-office and utilize outside laboratories for all specimen processing. Some testing can be performed at home with test kits to collect urine, saliva or stool. In all cases, we will assist you in coordinating initial and follow-up testing. Do I have to see the physician in person? Yes, our doctor’s medical licenses require that they meet with a patient in order to provide an initial medical consultation, and there is no substitute for that initial doctor-patient connection. Follow-up appointments can be arranged by phone or in the office. Do the doctors prescribe medicines? Our doctors can and do prescribe medications whenever necessary. They are fully licensed and Board-certified. Our office has a firm 24-hour cancellation policy. You will be responsible for the full cost of a missed appointment with the doctor (or a cancellation less than 24 business hours in advance). You will be charged a $35 fee for a missed IV or blood draw appointment (or a cancellation less than 24 business hours in advance). Can I bring lab results from other practitioners or done on my own? Yes, we encourage patients to bring in any relevant lab test results or medical records from other practitioners. You can bring this to your initial consultation, or any follow-up appointment, or load it directly into your ChARM Patient Portal. All of your vitamins and/or medications (in their original containers if possible, otherwise, as a list containing including detailed ingredients and dosages). Any recent lab test results and/or medical records (if possible these should be uploaded into your ChARM Patient Portal prior to the appointment). Do I need to be fasting for my initial consultation? If the appointment time is such that you are able to arrive fasting, that is highly recommended. For most patients, the doctor will recommend a fasting bloodwork panel (no food or drink other than water for 8 hours prior). If you arrive to your appointment fasting, we can do the blood draw immediately following the consultation. We are located at 11695 National Blvd, Los Angeles, CA 90064. Our hours of operation are M-F 9 am – 4 pm (we are closed for lunch from 12pm -1pm and the office is closed to patients on Thursdays).